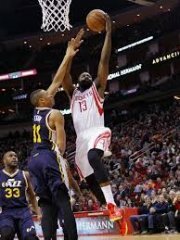 HOUSTON -- James Harden scored at least 30 points for the 15th time this season and the Houston Rockets easily dispatched the Utah Jazz, 97-82, on Saturday night at the Toyota Center. Harden made 4-of-8 triples and 8-of-14 field goals overall to carry the Rockets to third their straight win. Houston improved its record to 26-11, third best in the Western Conference behind the 29-8 Portland Trail Blazers and the 29-5 Golden State Warriors. "We are catching a rhythm, a serious rhythm defensively. We looked pretty solid and we're sharing the ball," Harden, who swished 10 of 11 free throws, told reporters after his team held Utah to 14 second quarter points while dishing out 24 team assists, four more than the Jazz. Donatas Motiejunas finished with 14 points and 10 rebounds while three other Rockets registered 10 points apiece -- Patrick Beverley, Trevor Ariza and Josh Smith. Dwight Howard was held to a relatively quiet eight points and eight rebounds in 37 minutes of play. Enes Kanter and Trey Burke each logged 16 points for Utah, which shot just 41.4 percent from the field on 29 of 70 shooting overall. Photo: James Harden (R) had another 30-point effort to lead the Houston Rockets past the Utah Jazz, 97-82.